control the display of your values. Datasets are becoming even more powerful! They now can be used for sourcing Dimension Values and, therefore, easily creating dimensioned Metrics and Reports. 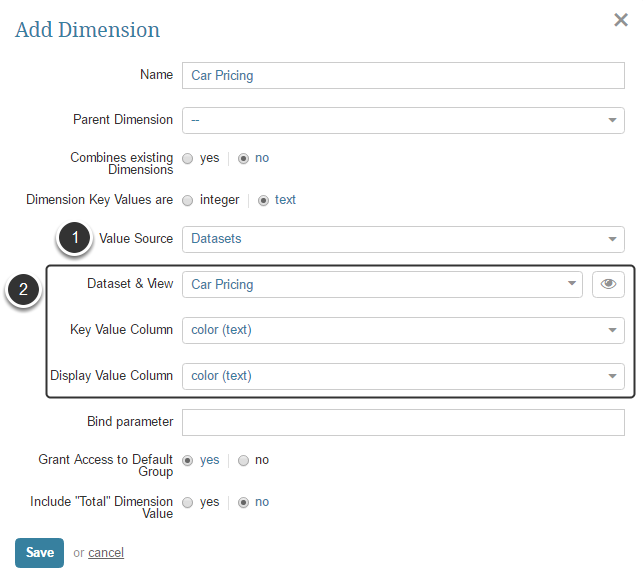 When creating a new Dimension at Content > Dimensions, a 'Datasets' option has been added to the Value Source field. Since the Add Dimension pop-up is dynamic, it allows you to select the Dataset that should serve as a basis of a future Dimension and a column containing required Dimension values right away. The ability to change the Column Names and setting Precision for floating numeric fields has been added to the Dataset Editor > Data tab. Once the statement/command for fetching Dataset values are succssfully Validated and the basic settings are Saved, the Dataset Columns table is displayed. If data element is a floating point integer, you can also change the number of decimals to display using the drop-down list on the Precision field. The data filtering logic in Datasets has been upgraded with a new parameter that, when combined with others, allows creating complex sophisticated queries and set precise conditions of data to be extracted. When constructing a Rule for filtering data in the Dataset, you can now exclude unnecessary values by applying "does not contain"capability. In prior versions, filters had to be incorporated manually into the Plugin commands. We have added a separate section that makes applying filters to the query a lot easier and more intuitive. You can apply filters manually or via the previously created Dimension Values. The same function is available for Tableau. 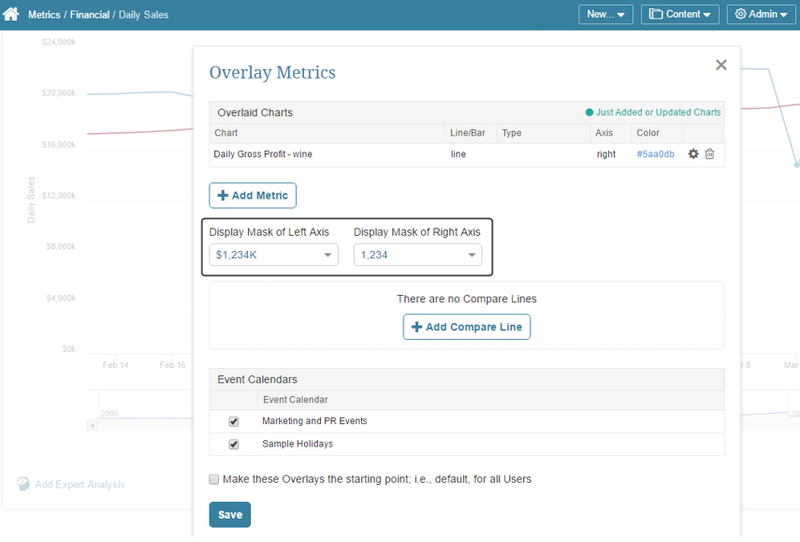 We are keen on adding more flexibility to Metric's functionality, so now when adding an Overlay Chart you can set the Display Mask to the right Y-axis explicitly. Two new drop-down lists have been added to the Overlay Metrics pop-up (which is reached by the Manage Overlays button below the Metric Chart). In each dropdown, the user can select from a list of available Display Masks. A new Privilege related to an ability of providing Expert Analysis to elements has been added to Regular and Power user profiles and Groups. Prior Versions included only one Expert Analysis related Privilege which, when assigned to a user, gave him an ability to leave a permanent note representing expert summary right below the element in the Viewer. Add Expert Analysis to any element: providing unlimited ability to add an Expert Analysis note to any element Power or Regular user has Permission to. For more details refer to: What is Expert Analysis? Element's last update time are now available right from the Homepage. To access it, hover over the Info icon at the upper right corner of the tile and the pop-up menu is going to be displayed. If the element is certified, click the green "certification" button. A new Version of Mobile application has been introduced. 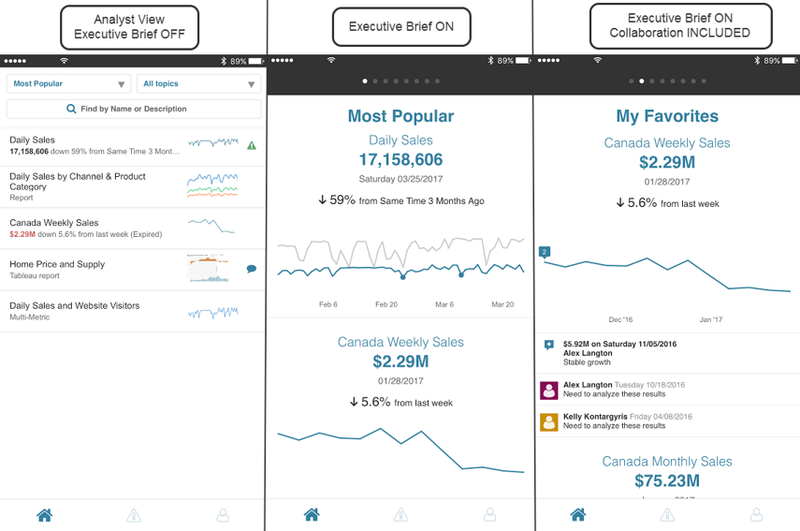 Analyst View: a regular mobile app mode, where you get alerted on any value peculiarities according to your subscriptions, review Metrics and Reports, interact with other users by means of collaborative entries (Notes, Comments, Annotations), switch between the Categories, add Events, etc., in other words, this mode allows you to interact with application in a way, similar to a desktop version. Executive Brief: Only Metrics are shown in this mode. This a simplified version of the app that is effectively static – there is no ability to share content, comment, or change Dimensions, etc. This is a great solution for those, who want to refer to the key information quickly. Executive Brief with Collaboration Included: This mode enables last 3 comments or notes on an the Executive Bries. You are free to open a Metric Viewer and review all comments and notes that have been added to this Metric. Also, in a new Version you can easily get to the list of all recent Alerts. DOWNLOAD FROM: App Store and Google Play. An issue with image collection can occur due to a parsing error. Improper values fetched from Tableau: If there are two or more Charts at the Tableau view, the data fetched from this view by the Tableau plugin is going to be improper; e.g., if there are two Charts, there is going to be twice the number of rows expected; if there are three Charts, three times the expected row are returned. This error occurs due to Tableau API issues (v. 9.3, 10.0). Current latest datacollector QV libs is not compatibe with QV12 Server. Plugin can not test connection due to unauthorized error 401. The object list cannot be updated when QV Server uses NTFS auth. When attempting to update the Reports list in the QlikView Plugin Editor which is using the Remote data collector, and no objects are found, then no visible changes occur in UI. An error message is to be added. Bursting: When a Burst is set up to "Include only what's been updated since last email", new Annotations which have been added to Metric's/Multimetric's charts since last email are not included into Burst Digest. Sisense: Sisense plugin used to cut images in External Reports. Reports: When the Report in the Report Editor > Data tab was set to Can historical instances be backfilled = 'yes' and Include current Month = 'yes', the backfill option in conjunction with the include current month setting worked incorrectly. Multi-Metrics: When a Multi-Metric (chart+data) was downloaded as a PDF file, the exceeding number of columns ran off the PDF page. Display Masks: Display masks for overlay Metrics were displayed incorrectly. Tile Reorder at the Homepage: Tile Reorder available for Favorite Folders at the Homepage did not function properly. Burst showed no distribution elements if the user who created it was removed from the system. Bursts sent at 00:00: Issues occurred with Bursts set up to be sent at 00:00. This has been fixed. Emails in iPhone: When different burst emails were opened on an iPhone, the same image was sometimes shown for different elements due to the image caching issue. This has been fixed.